رضاپور, مهدی. (769). تحلیل زمین‌لرزه 11 فروردین 1385 سیلاخور در استان لرستان. مجله ژئوفیزیک ایران, 3(1), 75-89. مهدی رضاپور. "تحلیل زمین‌لرزه 11 فروردین 1385 سیلاخور در استان لرستان". مجله ژئوفیزیک ایران, 3, 1, 769, 75-89. رضاپور, مهدی. (769). 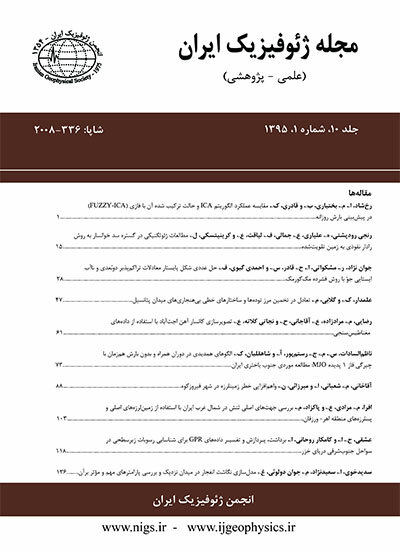 'تحلیل زمین‌لرزه 11 فروردین 1385 سیلاخور در استان لرستان', مجله ژئوفیزیک ایران, 3(1), pp. 75-89. رضاپور, مهدی. تحلیل زمین‌لرزه 11 فروردین 1385 سیلاخور در استان لرستان. مجله ژئوفیزیک ایران, 769; 3(1): 75-89. زمین‌لرزه سیلاخور با بزرگی Mn = 6.0 (بزرگی ناتل) روز جمعه ساعت 4:47:03 به وقت محلی در بخش چالان‌‌چولان از توابع شهرستان دورود رخ داد و به منطقه خصوصا دشت سیلاخور خسارات مالی و جانی فراوانی وارد شد. در این تحقیق، پس‌لرزه‌های ثبت‌‌شده مجددا مکان‌یابی شد و سازوکار کانونی زمین‌لرزه اصلی با استفاده از قطبیدگی (پولاریته) اولین امواج رسیده به ایستگاه‌های ثبت‌‌کننده تعیین شد. سازوکار کانونی به‌دست آمده نشان می‌دهد که قطعه گسل فعال شده در این زمین‌لرزه، دارای سازوکار امتدادلغز راست‌‌گرد است و به سوی شمال شرقی شیب دارد. توزیع پس‌لرزه‌ها و موقعیت زمین‌لرزه اصلی وهمچنین پهنه‌‌های هم‌‌شتاب نشان می‌دهد که شکست گسل مسبب زمین‌لرزه سیلاخور یک‌‌طرفه بوده و از قسمت جنوب شرق شروع شده و به سمت شمال غرب ادامه داشته است. توزیع سطحی پس‌لرزه‌‌ها نشان می‌دهد که‌ آن‌ها در دو ناحیه بیشتر فعال شده‌اند. قطعه اول که بین دورود و سیلاخور قرار دارد زمین‌لرزه اصلی را هم در بر می‌گیرد. قطعه دوم بین سیلاخور و بروجرد قرار دارد و به نظر می‌‌آید که در بین این دو قطعه گپی به طول تقریبی 10 کیلومتر وجود دارد که فعالیت پس‌لرزه‌‌ای قابلِ‌‌ملاحظه‌‌ای نشان نداده است. Iran is located in a very complex tectonic area, where continental shortening takes place due to the collision of the Arabian and Eurasian plates. This Arabia-Eurasia Convergence occasionally causes a distractive earthquake such as the Silakhor Earthquake to occur in Iran. The March 31 2006 Silakhor Earthquake, with a magnitude of Mn=6.0, occurred on Friday at 4:47:03 local time near the village of Chalan-Cholan in Lorestan province. It was preceded by two large foreshocks with magnitudes of Mn ‌‌=‌‌‌‌ 4.7, 5.2 and followed by two relatively large aftershocks of Mn=4.9 and 5.3. The Silakhor plain was seriously affected in earthquake: about 70 people were killed and more than 2000 were injured (Mirzaei Alavijeh et al. 1385). Mahdavifar and Tajik (1385) reported a macroseismic intensityof I0 = VIII on the MSK98 scale for the Silakhor Earthquake. The earthquake sequence occurred along the Main Recent Fault (MRF) in the northern Zagros. The right-lateral strike-slip displacement along the MRF fault is about 3 ± 2 millimeter per year (Vernant et al. 2004). All seismic stations which recorded Silakhor earthquake are located at a distance of at least 100 kilometers from the epicenter. No attempts were made to record micro events by deploying a temporary seismic network in the source region. To analyze this earthquake, an approach was made to relocate the recorded sequence by gathering all available data and using a proper velocity model. The region in this study enclosed between 48.4º to 49.2º east longitudes, and 33.3º to 34º north latitudes. The Silakhor earthquake sequence was recorded in many permanent seismic stations. These stations are operated by the University of Tehran's Institute of Geophysics (IGUT), the International Institute of Earthquake Engineering and Seismology (IIEES), and the Karkeh Dam. All picked phases data were compiled from the bulletins of organizations listed above. Additionally, in order to plot a PGA contour map of the source region, the acceleration data recorded in stations which are run by the Building and Housing Research Center (BHRC) were used. For this research, recorded events were relocated by using different location programs and a proper velocity model. The results show that applying the Hypoinverse program (Klein, 1984) gives less errors for hypocenter parameters in comparison with other location programs, such as Hypo71 (Lee and Lahr, 1975) and Hypocenter (Lienert et al. 1986). The focal mechanism of the main shock was determined by using the polarity data of the first arrival waves in the seismic stations. The mechanism for the mainshock was obtained as Strike/Dip/Rake = 310º, 46º, 171º. The obtained focal mechanism shows that the activated fault segment in this earthquake has a right lateral mechanism with a dip toward the north-east. The focal mechanism of mainshock and iso-acceleration curves show that the mainshock rupture in the Silakhor Earthquake was a unilateral rupture and that it initiated near the southeastern end of the rupture zone and propagated toward the northwest. The distribution of relocated aftershocks shows that in the area of this earthquake two fault segments were active. The first segment, which includes the main shock, is located between Dorud and Silakhor. The second segment is located between Silakhor and Borujerd. It seems that there is a gap of about 10 km length between them.